We are continuously working on making MAXQDA even better: With every update we offer you improved or completely new features! Others may charge you extra for this service – as a MAXQDA license holder, you can regularly take advantage of free program updates. Search for available updates by clicking ? > Search for updates on the top right of the MAXQDA window. 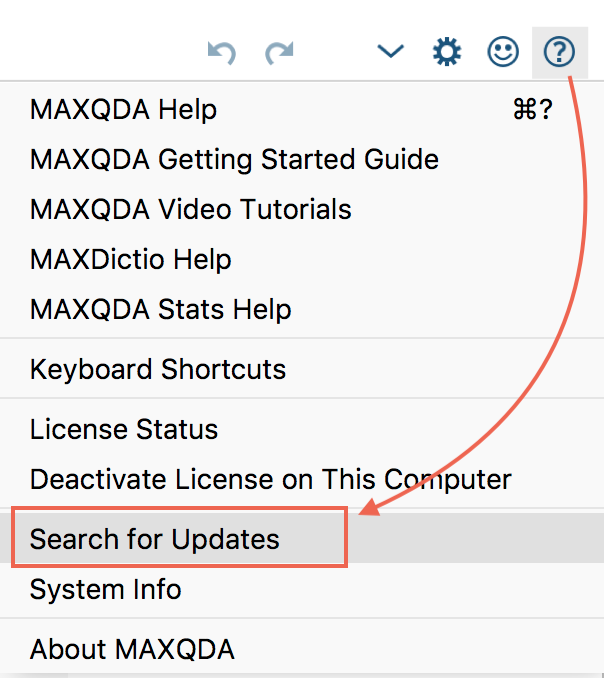 Take a look at the MAXQDA release notes to see which features are new in each update. Windows users need admin rights to install updates (otherwise the button is grayed out). In Windows 7 it may be necessary to start MAXQDA by right-clicking on the MAXQDA Icon (on the desktop or start menu) and choosing Run as administrator. Downloading the latest version of MAXQDA 2018 is easy. Just download the trial version (and unlock it with your serial number). The trial is always the current version of MAXQDA 2018. Users with a portable license please click on the download link in the installation guide that was sent to you in the delivery e-mail or contact our online support team. Search for available updates with Help > Search for updates. Search for available updates with ? > Search for updates. Windows users need admin rights to install updates (otherwise the button is grayed out). In Windows Vista and 7 it may be necessary to start MAXQDA by right-clicking on the MAXQDA Icon (on the desktop or start menu) and choosing Run as administrator. The last version of MAXqda 2 is version 2R060307-G. Please check if you have this latest version by clicking on the help menu (“?”) in MAXqda2 and selecting Info. If you do not have this most recent version, you can download it by clicking on the link below. After downloading the update, double-click on it and follow the on-screen directions. MAXqda was replaced by its successor MAXqda 2 and will no longer be updated. Download the archive file and extract the file “max2k.exe” from the archive. Copy this file to your MAXqda program folder “MAXQDA” and REPLACE the old file “max2k.exe”. The program folder will be saved in C:\Program Files\ if another location was not selected during the first installation of MAXQDA.